Despite a drop in wins in 2015, Australia’s first WorldTour team sets high expectations for its 25-man roster next season. NEW ORLEANS — Australian WorldTour team Orica-GreenEdge announced its 25-man roster for the 2016 season on Monday, and expectations have never been higher. With seven fewer wins on the scoreboard in 2015 compared to back-to-back 35-win seasons the previous two years, it may appear, on paper, that the team is slipping — luckily for Orica, races are won on the road not spreadsheets. In fact, Orica has more potential than ever as it heads into the new year — especially considering that 22 of this year’s 28 wins were recorded by riders 25 years of age and younger. While the 18 riders returning grow a year older — and wiser — the average age of the team remains at 27, one of the lowest in the pro peloton. Australian sprinting sensation Caleb Ewan, 21, is one of the highlights of the team’s youth movement. While not the youngest rider on the team, he is perhaps the most lethal. Tasked with just five wins this season, the 2014 under-23 road worlds silver medallist hit his quota in just his first four UCI races. 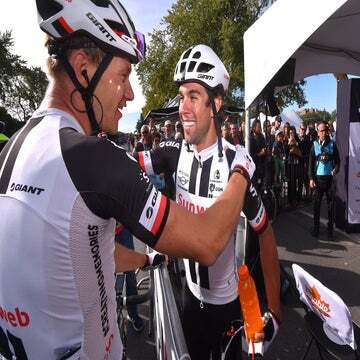 Two stage wins each at the Herald Sun Tour and Le Tour de Langkawi got the ball rolling en route to 11 wins on the season after blistering Tour de Korea for four stages, as well as the youth, points, and general classification titles. Ewan hit a high note at his rookie grand tour, the Vuelta a España, where he won stage 5. With the team’s sprint train now bolstered by 2014 Giro d’Italia stage winner Luka Mezgec, 24, who played a key role in Marcel Kittel’s success at Giant-Alpecin, and the continued development of Magnus Cort, 22, Orica is no longer and one-trick pony. White is expecting more WorldTour sprint victories and another grand tour stage win from Ewan next season. Sprinting is not the only specialty the team is starting to explore. Riders like Esteban Chaves, 25, and the 23-year-old Yates twins, Adam and Simon, are giving Orica fans some hope as grand tour contenders. At the moment, Chaves has the best chance to podium. The recently crowned Abu Dhabi Tour winner already padded his palmarés with a stage win at the Giro this year, as well as two at the Vuelta en route to fifth-place overall. In fact, the Colombian climbing sensation went on to wear four classification jerseys, including the mountains, points, and combination, plus he spent six days in the red leader’s jersey. That leaves the Yates twins to focus on the Tour in July. The two Brits began to make their mark in 2014 with Adam’s win at Tour of Turkey and Simon’s mountains classification at Tour of Alberta, but they have truly arrived this season. Adam took his first WorldTour win at Clásica de San Sebastián while Simon had a standout performance to win the best young rider’s jersey at the Critérium du Dauphiné. 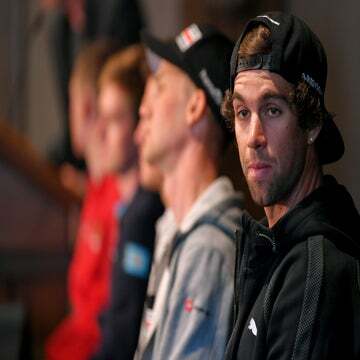 “I am not going to rule them out of contesting GC at the Tour de France next year as they have surprised me time and time again this year,” said White. “We have a lot of racing between now and July, and these guys are improving monthly. Although Orica is now broadening its scope to include legitimate sprint and grand tour aspirations, the team is not about to neglect the classics — its bread and butter the past four years. While a healthy Simon Gerrans has proved nearly unbeatable, 25-year-old compatriot Michael Matthews is quickly following in his wheel tracks and putting the team in position for a potential decade of dominance. Matthews’ stock continued to rise in 2015 with stage wins at Paris-Nice, Tour of Suisse, and Tour of Alberta, along with his second career stage win at the Giro. The Canberran also found the podium at both Milano-Sanremo and the Amstel Gold Race. White concurred. “I agree with Jens, sooner or later Matthews will be a world champion. When you look at his season and the targets we set for him, he ticked all the boxes. White also believes that Matthews’s gutsy performance at this year’s Tour will pay dividends in the immediate future. “We have to take the positives out of the Tour,” he said. “Matthews went through some pain thresholds that at times I don’t think he thought he was capable of finishing. But even in that last week of the Tour, he was battling on the mountain stages and ran top 10 at the Champs-Élysées. Aaron S. Lee is a cycling and triathlon columnist for Eurosport and a guest contributor to VeloNews.